Spike's New York Pizza Binge Is for "Research"
Spike Mendelsohn slams a banh mi at Baogette in New York. Top Chef season-four contestant Spike Mendelsohn (the one with the funny hats) is in town to shoot his online series for Food2, the gig he got after auditioning for the Food Network. 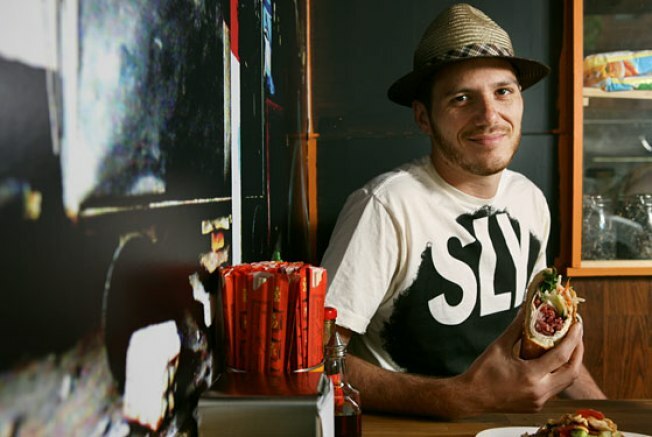 He'salso location-scouting for a Manhattan outlet of his D.C. restaurant Good Stuff Eatery, but lower rents in South Beach and L.A. could draw him there instead. For this week's New York Diet, there was still plenty of time to eat at friends' restaurants (Michael Bao Hunh and Paul Liebrandt), and to singe his palate as he plans an as-yet-unnamed Washington pizzeria. I was in D.C. I started the day off at this great little place called Pellegrine on Capitol Hill. They serve organic espresso and just take pride in what they do here-- it's not like a Starbucks or anything -- and they brew their coffee at the perfect temperature. Then I cruised around the corner. I grabbed a Nutella crepe at a little food stand at Eastern market. It's so delicious and cheap and I can get it on the fly on my way to work. There'sa cheesemonger there and they serve the best Cheddar. They have a lot of samples, so I like getting a little nibble of that. Cheddar and espresso: It's the best way to start the day. After I hang out in the market for a little bit, I hit up this new place called Taylor on H Street. It's a developing, very hip area in D.C., with new restaurants coming in, and Taylor serves the best sandwich in D.C. right now. They get the bread delivered every day from Philly. My favorite sandwich is breaded chicken with sauteed broccoli rabe and pesto. I ask for an extra lemon because the broccoli rabe is really bitter, so I need a lot of lemon all over it. I took it to work with me. They also have Coca-Cola by the bottle there, which I love. After I got to work, I scarfed my sandwich and I'vee been getting in the habit of always having the signature milkshake from my restaurant. It's called the Toasted Marshmallow. I usually get a miniature one because I can't have a whole one. We roast our own marshmallows, and we make our own marshmallow fluff. We blend it with a little bit of milk and it's just delicious. In the afternoon it gets kind of hot now, and I like to go to this outdoor pool at the Capitol Skyline Hotel. I sit poolside and I take a little dip. They have these great zucchini corn beignets. I'm saving drinks for dinner. II usually like to start the night out at Michel Richard’s restaurant Citronelle. They make the best cucumber gin and tonics. They make their tonic, and it’s so refreshing. I like to spice it up a little bit, so after that I went to my good friend Jose Andres’s restaurant Oyamel and just scarfed some pork tacos, some amazing ceviches, and had a margarita. That was dinner. The margarita was the dessert. I took the train to New York. I love going to the Congee House on the Bowery. They make the best congee, obviously. They serve great pork and preserved egg, thousand-year-old egg, and these delicious savory doughnuts with tea. In the area after that, I can’t resist getting some steamed pork buns from this little bakery on Mulberry Street. I’m always in the mood for some pizza, so around 2:30, 3 we went to Lombardi’s, had a margherita pizza — I’m a simple guy — and a pitcher of Peroni. I was with a couple of friends including one of my chef-partners. After the pizza we wanted to do something a little more serious, so we went to Corton, which a friend of mine, Paul Liebrandt, recently opened. He’s one of the best new chefs in New York. It was 6:30 maybe, just before anyone got there. It’s always nice to go there because I never have to stay for the fourteen-course meal or whatever. I’ve known Paul for maybe two and a half years now. I was working for Drew [Nieporent], who owned my Vietnamese restaurant [Mai House], and Paul was practicing all of his stuff in my kitchen. So I just got to know him through association. We had a beet gelée with foie gras, a pork-belly dish, and an oyster with Japanese-beer gelée. I don’t think that was on the menu; I think he just threw us a bone. After Corton, we went to anotheroom and had some beers. Then we traveled to 99¢ Pizza. It’s a dollar; super-thin crust. I had two to three slices there and then we called it a night. The next day I was staying in Brooklyn, so we went to one of my favorite places, the Tea Room in Williamsburg. We went there for brunch at 12:30, 1 p.m. because I slept in. I had fresh-squeezed O.J., some coffee, and then ordered crispy trout with potatoes, mushrooms, and poached eggs, and soaked up all the egg with the country bread they serve there. It was just delicious. I walked it off a little bit, saw a couple of shops, went down to Williamsburg’s main street, Bedford. I sat outside of Fabiane’s with the paper. It feels like a little piece of Europe. I had a cup of coffee, and ordered the pistachio cake, for giggles. I only ate half of it. There’s a really great cheese shop there. I just kind of looked at the new cheeses they had, chatted. I didn’t buy anything. I did some more strolling around and before I left I had a falafel at Oasis by the metro. There’s a better one in the city by the Comedy Cellar, Mamoun’s. After falafel I had a little bit of a siesta, and then dinner at Grimaldi’s. I love my pizza. I’m opening a pizzeria in D.C. in the next three or four months. I just took over the building the other day. I’m researching pizza, so I’m trying to hit up all the spots. They do a great coal-fire pizza. I had pepperoni and green peppers on it and a pitcher of beer. I love watching the owner give everybody attitude in the restaurant; it’s part of the ambience. I don’t think I want to have coal fire. I want to have American-Napolean [sic] pizza. But not a true Napolean [sic] pizza; it needs to be Americanized a little bit. The true pizza from Napoli is really soggy in the middle, and you have to eat it with a knife and fork. I don’t think it’ll take well to the American palate. I mean, most pizzas in the States that are called Napolean pizzas are crispier. That was the night. Next day I went to my favorite place in the whole entire world. It’s called Barney Greengrass, the Sturgeon King. I had some chicken livers, pastrami with eggs, and a basket of bagels. Luckily enough they were serving potato latkes with sour cream and applesauce. I had coffee, no orange juice. After Barney Greengrass, I went to see one of my good friends, Michael Bao at Baoguette. He’s launching them all over the city. I met Michael Bao through school years ago. I had been doing French food for many years and was looking for something really fresh and new to do and gave him a call and organized a chef’s tour of Vietnam. I rounded up a bunch of people and we cooked our way from north to south. We spent about three to four months there and he really showed me his culture, his food, and I was just inspired. I had a soup called bunbahue. It’s a spicy soup with pork belly in it and noodles and fresh herbs. And a Coke. He makes this great soft ice cream out of pandan and durian, really exotic flavors. I nibbled on one of those. Then I took a bánh mì with me. After that, I had to get right back to my roots and I went to Kefi, which is one of my favorite Greek restaurants. Michael Psilakis does amazing food, like my grandmother’s food, my mother’s food. I’m 100 percent Greek. I ordered a lot of stuff off the appetizer section. They have these dumplings that are really great. I ordered keftedes, tarama, tsatsiki, the dipping sauces. I had a piece of fish there, calamari, loukaniko, Greek sausage. And then they have a great bottle of Robola from Kefalonia, which is where my family is from. I downed two bottles of that with a bunch of appetizers and then called it a night. For breakfast today it was eggs and bacon in my hotel. After you do such an eating excursion, it’s nice to just lay in bed. I’m in town until Saturday morning. Tonight I’m going on a pizza excursion. I rented a car and I’m doing a bunch of pizza places: Emporio, Una Pizza Napoletana, which I can’t even pronounce, Kesté, San Marzano, Tonda. I’m going to cruise by Artichoke just to taste the artichoke pizza.Today is all about pizza. That’s why I took it so light with breakfast.